Onion is a high value vegetable with a growing demand. Onion farming in northern Ghana is a source of revenue not only for farmers, but also for input dealers, middlemen, transporters, and farm labourers. The Upper East region produces 85% of the total onion production in Ghana? The crop thrives in dry soils and low humidity: an estimated 75% of onions are produced in the dry season, when soils are dry and humidity is low. Cash inflows from onion farming enables producers and other actors to procure farm inputs for the major season staple crops production. However there is a domestic supply deficit which is being met by imports. 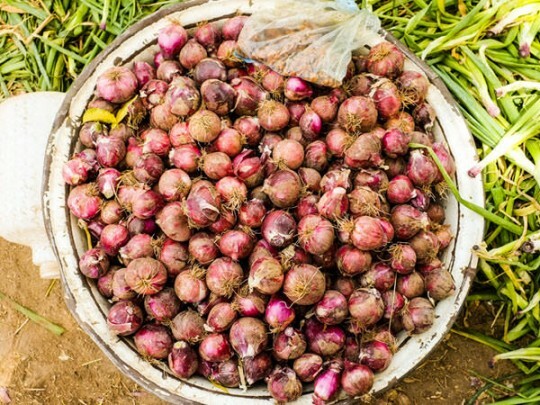 The consumption of onions is increasing in Ghana, themarket is growing at an estimated 11% per annum, indicating that onion production is sustainable into the future: it will continue to deliver good value to the smallholder farmers involved in its production. Northern Ghana has a competitive advantage in onion production: more than 20,000 households in northern Ghana grow onion in the dry season for cash. Onion is a high labour, demanding crop, with substantial employment creation opportunities. Improve farmers access to and use of improved varieties of onion seeds and inputs. Our market screening highlighted the limited adoption of improved onion seed varieties by smallholder farmers in the North. This is due to a number of factors including the inability of public research institutions to develop effective partnerships with the private sector to commercialise the findings of their research on improved varieties. In addition the public extension systems has failed to deliver information to farmers on the benefits of using improved seed and the practices required to maximise yields from these varieties. MADE is actively facilitating partnerships between the public sector (particularly the extension service) and private seed suppliers to both increase farmers knowledge of and access to improved onion seed varieties. This involves increasing their capacity to work together to organise and effectively manage demonstrations to showcase improved onion varieties and to disseminate information on good agricultural practices. MADE is also actively promoting commercial supply relationships between major international seed suppliers and local input dealers on the ground in the North. Improve the onion supply chain in northern Ghana. The strengthening of the supply chain between onion farmers and end-buyers is required to incentivise farmers to invest in and adopt improved production technologies (seed and inputs). Currently a combination of coordination failures and infrastructural weaknesses along the value chain reduces the farmers incentive to invest in these improved technologies. MADE is exploring several avenues for improving the supply chain, including promoting investment in improved infrastructure for storing, cleaning and packing through PPPs, the development of warehouse receipt systems, and the brokering of commercial relationships between producers in the North and buyers in the South. During the 2015 rainy season, 2,400 men and 1,280 women smallholder farmers (added to the previously trained 1,500) trained on GAP, with early indications of 34% GAP adoption rate. 25 agricultural extension agents trained on how to apply GAP for improved dry season onion varieties. East West Seed, one of MADE partner input suppliers, expanding their commercial supply relationship from 2 to 15 input dealers. 1,491 smallholder farmers purchased improved seed varieties in one season – this is very significant, given that both rainy season cultivation and the purchase of onion seeds are relatively new practices for the majority of farmers.